A recent UN study claims that a large share of exports from developing countries goes unreported and that smuggling is a likely explanation. But many analysts argue that the discrepancies are statistical errors. This column suggests that although some malfeasance is at play as the trade gap is correlated with tariffs and corruption, this statistical relationship cannot identify countries or shipments that are corrupted. There's smoke, but no smoking gun. In July 2016 the UN published a study claiming that a large share – 67% in some cases – of exports from developing countries goes unreported (UNCTAD 2016). A likely explanation according to the UN is smuggling. The Financial Times headlined the story, “Misinvoicing of commodities costs billions to developing world”. But almost immediately analysts pushed back. Tim Worstall at Forbes wrote “UNCTAD Needs To Get A Clue”, and Maya Forstater blogged about it as “The Great Gold Heist that Never Was”. Both see the examples in the UN study as having innocent explanations. What’s going on? First, understand that official trade statistics between countries are published twice – once by the importing country, and once by the exporter. In principle, the two values should differ a bit, because the importer reports include freight costs. But in practice, the differences can be enormous. Côte d’Ivoire claimed exports of $3.6 billion worth of cocoa to Germany over 20 years, but Germany reported receiving more than twice that much. Where did the extra come from? Sometimes the misreporting goes the other way. Chile reported exports of $16 billion more copper to the Netherlands than the Netherlands reported importing from Chile. Where did the rest go? The UN report describes more of these discrepancies, and attributes them in part to corruption and smuggling, but the analysts explain the discrepancies as statistical errors, transit trade through third countries, futures markets, or consignment ports. Who is right? There is an easy solution to this puzzle. If the discrepancies reported by the UN are statistical errors or transit trades, then the gap between reported imports and exports shouldn’t be correlated with the tariffs those countries are charging, or how corrupt their officials are perceived to be, or whether they have strict auditing and accounting standards. And those are easy correlations to check. That research expands the examples in the UN report, but only for single countries or groups of countries. In a new paper, we examine mispreported trade on a global scale (Kellenberg and Levinson 2016). Rather than using industry-by-industry data, we take a broader perspective using aggregate annual trade between each of the countries, focusing on the difference between the total trade reported by the exporting country, and the total trade reported by the importer. We define the trade reporting gap as the difference between the annual dollar amount of trade between two countries reported by the importer, and that same amount reported by the exporting country. To adjust for the scale of annual trade flows between pairs of countries, we divide that gap by the sum of the two reported amounts. This reporting gap can in theory range from -1 to +1, but the two reports are only supposed to differ by trade costs, so the gap should be small and never negative. In practice, however, mismatches between reported imports and exports are enormous. For a significant fraction of the annual observations, the importer reports either more than twice or less than half of what the exporter reports. Our guess is that most of these vast differences have plausible alibis: misplaced decimal places, currency conversion errors, typos, or the type of transit trade the UN report’s critics describe. The upper-right panel in Figure 1 plots the gap against exporters’ GDPs. Larger, wealthier exporting countries have smaller trade reporting gaps, suggesting something more systemic may be occurring in the reporting of exports by smaller, less wealthy nations. The bottom two panels compare measures of countries’ policies and institutions, possible here because we use aggregate rather than industry-level data used in prior studies. The bottom-left panel shows that exporters with better auditing and accounting standards have smaller gaps. The standards presumably reduce the ability of exporters to underreport exports. And in the bottom right panel, exporters with more corruption have larger gaps, presumably because they do underreport exports. Notes: Weighted average tariff rates for each country and year from the World Bank Development Indicators. Exporter accounting and auditing standards based on the World Economic Forum’s Global Competitiveness Report. Corruption data from Transparency International’s Corruption Perceptions Index. The correlations in Figure 1 suggest malfeasance in the spirit of the UN report’s conclusions. There is no reason dropped decimals or transit trade would be correlated with tariffs, accounting standards, or corruption. So something else must be going on. Of course, Figure 1 is merely suggestive. Tariffs are correlated with GDP. Both are likely correlated with corruption, accounting standards, and other country characteristics that affect trade gaps. 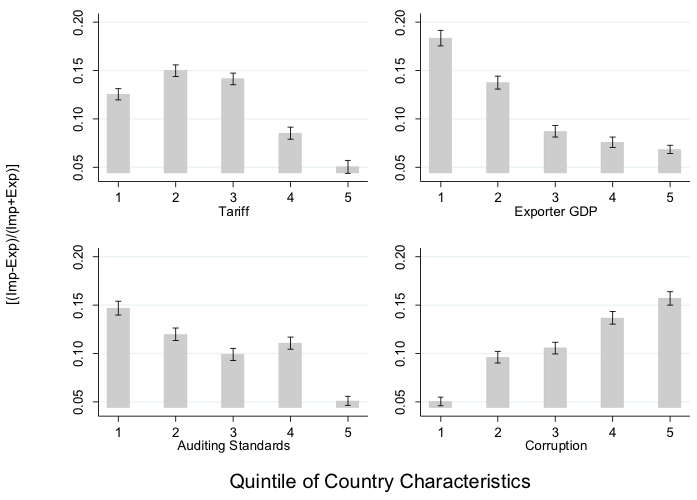 To study how trade reporting responds to country characteristics more systematically, in our paper we show how the gap varies by country pair, holding constant country characteristics including those in Figure 1. We find that tariffs, auditing and accounting standards, and corruption levels all have statistically significant effects on the reported trade gap. Further, these effects vary according to the countries’ development levels and whether they are members of regional trade agreements. To be clear, our approach cannot identify specific countries or shipments that are corrupted. It's a statistical relationship. We see tariffs being evaded, but we can't point to a particular country’s tariffs that are going uncollected. There's smoke, but no smoking gun. So the UN and its critics are both correct. The UN is right to be worried about what it calls ‘misinvoicing’. Statistical evidence suggests it is there, and is explained in part by wrongdoing. But statistical evidence of wrongdoing can’t be used to prosecute particular cases of corruption, like the case of cocoa from the Cote d’Ivoire. Any one such example likely has a less nefarious explanation, as the UN’s critics document. Bhagwati, J (1964), “On the Underinvoicing of Imports” Oxford Bulletin of Economics and Statistics, 26: 389-397. Bouët, A and D Roy (2012), “Trade protection and tax evasion: Evidence from Kenya, Mauritius, and Nigeria”, The Journal of International Trade & Economic Development: An International and Comparative Review, 21(2): 287-320. Epaphra, M (2015), “Tax Rates and Tax Evasion: Evidence from Missing Imports in Tanzania”, International Journal of Economics and Finance, 7(2): 122-137. Ferrantino, M J, X Liu and Z Wang (2012), "Evasion behaviors of exporters and importers: Evidence from the U.S. – China trade data discrepancy”, Journal of International Economics, 86: 141-157. Fisman, R and S-J Wei (2004), “Tax Rates and Tax Evasion: Evidence from “Missing Imports” in China”, Journal of Political Economy, 112(2): 471-496. Javorcik, B S and S-J Wei (2004), “Pollution Havens and Foreign Direct Investment: Dirty Secret or Popular Myth?”, Contributions to Economic Analysis & Policy, 3(2), Article 8. Kellenberg, D and A Levinson (2016), “Misreporting Trade: Tariff Evasion, Corruption, and Auditing Standards”, NBER Working Paper No. 22593. Mishra, P, A Subramanian and P Topalova (2008), “Tariffs, enforcement, and customs evasion: Evidence from India”, Journal of Public Economics, 92: 1907-1925. Rotunno, L and P-L Vézina (2012), "Chinese Networks and Tariff Evasion," The World Economy, 35(12): 1772-1794. Rotunno, L and P-L Vézina (2015), "Quota-Hopping In-Bond Diversion," Economic Inquiry, 53(1): 34-48. Stoyanov, A (2012), “Tariff evasion and rules of origin violations under the Canada-U.S. Free Trade Agreement”, Canadian Journal of Economics, 45(3): 879-902. UNCTAD (2016), Trade Misinvoicing in Primary Commodities in Developing Countries, UNCTAD/SUC/2016/2. Vézina, P-L (2015), "Illegal trade in natural resources: Evidence from missing exports," International Economics 142: 152-160. See Javorcik and Narciso (2008), Mishra et al. (2008), Ferrantino et al. (2012), Stoyanov (2012), Bouët and Roy (2012), Epaphra (2015), Rotunno and Vézina (2012 and 2015), and Vézina (2015).